Top C-Level executives were recently in San Francisco for Oracle Open World and our team at SF Bay Photo and Mirror Booth was asked to provide an elegant and engaging entertainment option for a reception dinner at the Asian Art Museum that would match the class and style of the attendees at this reception dinner. SF Bay Photo and Mirror Booth set about creating a custom activation that matched the style and theme of the event and also provided an engaging and interactive experience for these top executives. 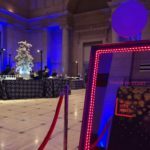 SF Bay Photo and Mirror Booth worked closely with our client to match color hex codes and meet all relevant branding guidelines for the event. We created a custom photo booth experience that would allow guest visiting from all over the world to connect with each other in a fun way and instantly create branded photos at the event. 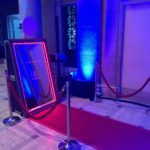 We brought in a red carpet and velvet roped stanchions to bring a level of elegance and class to the photo booth. We designed a custom graphic overlay for instant print on demand photos from the booth. 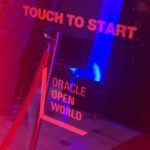 Oracle Open World reception dinner attendees were delighted by the chance to take part in a unique photo experience. Many of the guests at the dinner took photos with their colleagues from all over the world. Every guest was able to walk away with a fully branded 4″x6″ printed image to save as a ‘memento’ from the dinner and their trip to the USA.